History in Space was a workshop on recording buildings. It was split into two parts; a traditional archaeology session and an art session. The archaeology session was led by a buildings archaeologist and a surveyor. Volunteers had a trip to the castle remains beneath the market and a guided tour around the market to learn about its history. They then learnt how to survey using a dumpy level. The art workshop was led by Kid Acne. 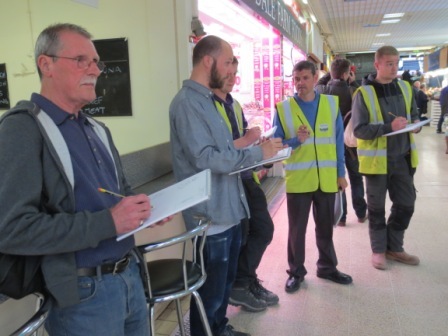 Volunteers learnt how to sketch the market – people, objects and the building. Some excellent artwork was produced which can be found in the Creative Zone of this website.